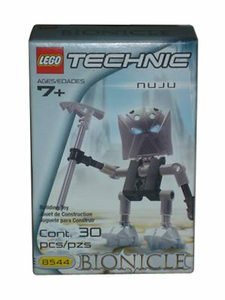 8544 Nuju is a BIONICLE set released in 2001. He is the leader of the village of Ko-Koro and protector of Kopaka's legend. He carries an ice pick as his only weapon; his other hand is bare. Pushing the lever on his back will cause his weapon-carrying arm to move. He wears the Noble Matatu, the Mask of Telekinesis. Turaga Nuju only communicates to the other Matoran using clicks and whistles, but he has been known to speak occasionally. The Ko-Matoran named Matoro is his interpreter. This is the same set as 1420 Nuju. Nuju can be combined with Vakama, Matau, Nokama, Whenua, and Onewa to make a Turaga-Nui. Orkahm wears the same mask as Nuju. Nuju Nuju may seem cold and uncaring, but he's actually one of the most generous Turaga. He tells his tales through gestures and whistles, which are interpreted by one of the Tohunga villagers. Nuju leads the village of ice and guards the legend of Kopaka.